In the year following Oklahoma’s statewide ban of texting while driving, Tulsa police have reported that only 75 citations have been issued for the offense between November 2015 and September 2016. This includes citations issued by the entire Tulsa police department. With approximately 10,000 tickets issued each month, texting and driving citations make up only a fraction of monthly citations. Oklahoma’s texting and driving ban, which applies to sending texts and emails behind the wheel, carries a $100 fine. If a vehicle is stopped, such as waiting at a red light, it is legal for drivers to text. Officers say the ban is difficult to enforce because there is no way that police can definitively prove the driver was texting, which may explain why so few citations have been issued. Currently, the department has no proactive measures for uncovering drivers breaking this law. If you’re injured at the fault of a distracted driver, an auto accident attorney in Tulsa can help you seek the compensation you deserve. When the ban went into effect last November, Oklahoma became the 46th state to make texting and driving illegal. 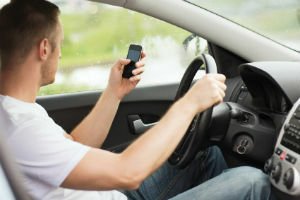 According to a 2015 Erie Insurance survey, one-third of U.S. drivers say they have texted behind the wheel and 75 percent say they have witnessed others texting and driving. If you have been injured in a car accident caused by a driver distracted by texting, you may be entitled to compensation. The auto accident attorney at The Edwards Law Firm will provide you with a free consultation and review your claim. We will fight to maximize your compensation and hold dangerous distracted drivers responsible for their actions. Contact us today.